Grandfather Mountain is one of the most popular tourist destinations in North Carolina and is an invaluable part of the state's natural heritage. The mountain is located in a corner of Avery County near the borders of Caldwell and Watauga Counties and is the highest point in the Blue Ridge Mountain range, with a peak of 5,964 feet. Formed more than 750 million years ago, Grandfather Mountain contains some of the oldest geological formations on earth and is one of the most readily recognizable mountains in the Blue Ridge. Called Tanawha ("fabulous bird" or "eagle") by the Cherokee Indians, the mountain acquired the name "Grandfather" from early settlers who saw the face of an old man's profile in the outline of the peaks against the sky. Well-known early explorers who visited the mountain include Daniel Boone, who reportedly explored the area in the mid-1700s; the French botanist and explorer André Michaux, who climbed the mountain in 1794; and Sierra Club founder John Muir, who visited in 1898. 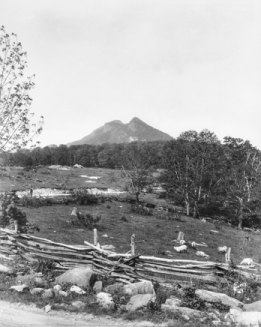 In the late nineteenth century, Grandfather Mountain was acquired by Donald MacRae of Wilmington, who purchased the mountain and a large tract of land in the area from the descendants of Gen. William Lenoir (the Revolutionary War leader for whom the Caldwell County town of Lenoir is named). MacRae planned to develop the area around Linville, and a development company called the Linville Improvement Company was organized. Eventually, one of Donald MacRae's sons, Hugh MacRae, became head of the company and directed the building of one of the first mountain resorts in the area at Linville. To further encourage tourism, he directed the construction of the Yonahlossee Road, now U.S. 221, between Linville and Blowing Rock. The natural beauty of Grandfather Mountain would prove to be the area's greatest attraction. Many visitors began to make the climb up the steep slopes to enjoy the mountain scenery from Grandfather's summit. For the first half of the twentieth century, access to the summit was by an old trail that curved up to a point where a wooden platform had been built at an overlook. A small fee was charged to visitors who wished to ascend to the viewing area. In the early 1950s, Hugh MacRae's grandson, Hugh MacRae Morton, inherited Grandfather Mountain. He proceeded to widen the old trail up the mountain and improve access to the peak. Morton directed the construction of a 228-foot suspension bridge, known today as the Mile High Swinging Bridge, at the summit. As a result, the number of tourists visiting Grandfather Mountain dramatically increased. Large numbers of visitors have also been drawn to two unique cultural events that are held on the mountain. Each summer since 1924, Singing on the Mountain, one of the country's longest-running "old-time" gospel conventions, has been held at the foot of Grandfather Mountain. In addition, the Grandfather Mountain Highland Games have been staged at the site since the late 1950s. Patterned on centuries-old clan gatherings in Scotland, the Highland Games have become one of the largest and most popular celebrations of Scottish heritage in the United States. Morton has also actively sought to preserve much of Grandfather Mountain's natural environment. He established a habitat for native wildlife, and, in cooperation with the Nature Conservancy of North Carolina, he set aside large areas of the mountain as a wilderness preserve. In the 1980s, after many years of negotiations between Morton and the U.S. Park Service over possible routes, the final section of the Blue Ridge Parkway was finally completed around Grandfather Mountain. At Morton's insistence this section of the parkway, the Linn Cove Viaduct, was built using special European-style construction techniques and individually preformed sections in order to minimize physical impact on the mountain's fragile environment. In 1992 Grandfather Mountain had the distinction of being selected by the United Nations Educational, Scientific and Cultural Organization (UNESCO) for membership in the international network of Biosphere Reserves. This entry on Grandfather Mountain was written in 2006. At that time the highest point of the mountain was represented at 5,964 feet above sea level as reported by the Grandfather Mountain organization and based on data from a circa 1917 survey. (The altitude data came from the 1917 North Carolina Geologic and Economic Survey Bulletin No. 27, entitled “Altitudes in North Carolina".) 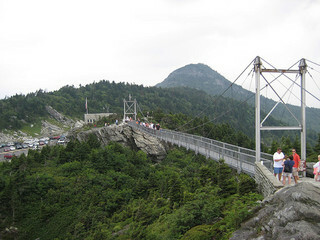 In 2007, the Grandfather Mountain company commissioned a re-survey to determine the mountain's highest point after surveyors discovered that a designated spot on the "Swinging Bridge" was actually less than the advertised "mile high". The new survey, utilizing global positioning and dual frequency receivers, calculated the highest peak at 5,946 feet above sea level, 18 feet lower than the earlier figure. "A Brief History of Grandfather Mountain," Grandfather Mountain News, vol. 1 (1995). Ron Fisher, Blue Ridge Range: The Gentle Mountains (1992). Grandfather Mountain. "Surveyors correct Grandfather Mountain's official elevation." November 6, 2009. http://www.grandfather.com/surveyors-correct-grandfather-mountains-offic... (accessed August 24, 2015). Mile High Swinging Bridge at Grandfather Mountain. Image courtesy of Flickr user Greg Walters. Available from http://www.flickr.com/photos/gregwalters/1834123208/ (accessed June 26, 2012). gm is so cool, had a doc on it !!! Please include the unbelievable sight of “the grandfather’s” Cardprofile along the mountain’s ridge line in your information. It is truly beautiful and an amazing sight. Just fyi - Calloway Peak, Grandfather's highest summit, is 5946 feet above sea level, not 5964 as the article states. Thank you for visiting NCpedia and taking time to alert us to this. This entry was published in the Encyclopedia of North Carolina (published by UNC Press) in 2006 and the survey that changed the mountain's "official" height was undertaken in 2007. I have just added an update for this "new" information. Thanks for helping us keep NCpedia content up to date!